​Hailed by The New York Times at their Carnegie Hall debut as “invariably energetic and finely burnished…playing with earthy vigor,” the Catalyst Quartet (Prizewinners of the Gianni Bergamo Classical Music Award 2012, Switzerland) is comprised of top laureates and alumni of the internationally acclaimed Sphinx Competition. The mission of the ensemble is to advance diversity in classical music and inspire new and young audiences with dynamic performances of cutting-edge repertoire by a wide range of composers. Founded by the Sphinx Organization, the Catalyst Quartet combines a serious commitment to education with a passion for contemporary works. The quartet has held residencies and given master classes both domestically and abroad at the University of Michigan; Rice University; Cincinnati Conservatory of Music; the In Harmony project, London; and the University of South Africa to name a few. They also serve as principal faculty at the Sphinx Performance Academy at Oberlin College and Northwestern University. The Catalyst Quartet members are visiting teaching artists at the Sphinx Preparatory Music Institute, hosted by the Detroit Symphony Orchestra and made possible in part through the generous support of Stuart and Maxine Frankel. The Catalyst Quartet has also participated in the Juilliard String Quartet Seminar, Grand Canyon Music Festival, and Great Lakes Chamber Music Festival, and has been featured in The Strad and Strings magazines. Multiple radio and television appearances have included American Public Media’s Performance Today as well as Houston Public Radio and Detroit Public Radio and Television. 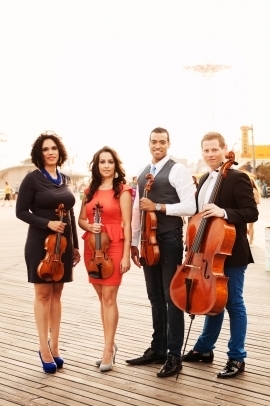 The Quartet maintains a busy performing schedule and completed a national tour last fall leading the Sphinx Virtuosi. Highlights of the tour included concerts at the Kennedy Center in Washington D.C., a return to the Harris Theater in Chicago, and sold out performances at Miami’s Frank Gehry-designed New World Center and New York’s Carnegie Hall (Stern Auditorium) with members of the legendary Guarneri Quartet. They can also be heard this season on the Cafe Series at the Metropolitan Museum of Art in New York City. Inspired by music’s ability to transform, the Catalyst Quartet seeks to change the way that classical music is perceived through diverse programming for a wide range of audiences.